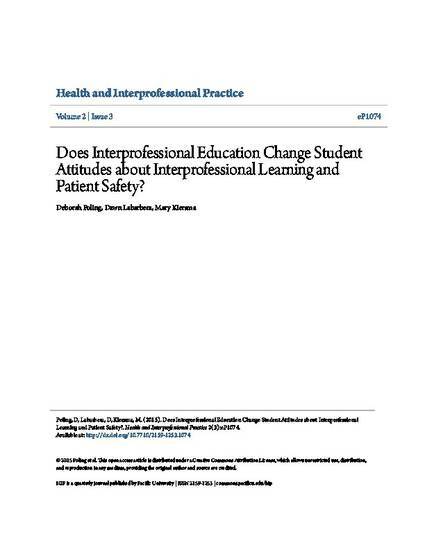 Does Interprofessional Education Change Student Attitudes about Interprofessional Learning and Patient Safety? INTRODUCTION The Fort Wayne Area Interprofessional Education Consortium (FWAIPEC) evaluated the outcomes of its educational initiative with a pre and post assessment utilizing the Readiness for Interprofessional Education tool (RIPLS). The seminar series was designed as a longitudinal team building experience to foster competency toward interprofessional collaborative practice. METHODS Participants from pharmacy, physician assistant, nurse practitioner, nurse educator, nurse executive, medical and family practice residency programs were surveyed as part of the curriculum assessment. RESULTS Primarily reflecting the required attendance of the pharmacy and physician assistant students, 122 participants completed both assessments (89.7% response rate). Wilcoxon signed rank tests were conducted on the 19 RIPLS items. Contrary to the goals of the program, there was a statistically significant change on six of the nineteen items which should have theoretically improved. CONCLUSIONS The RIPLS did not capture the results from informal qualitative reporting that included debriefing sessions, program level debriefing, or and program journaling assignments. To that end, FWAPIEC is in process of piloting a new pre/ post assessment tool in an effort to capture its outcomes. © 2015 Poling et al. Licensed under a Creative Commons Attribution 4.0 License.